In 1842, writer and poet Edgar Allan Poe wrote and published a short story called “The Masque of the Red Death.” It was a literary work that reflected his attempt to avoid a plague. Although the actual Red Death plague was fictional, Poe did pull inspiration from an actual illness to create the story. Later in Mexico, an unexpected and dangerous plague occurred to which the people referred to as “The Red Death.” Chris Burke of Pinellas Park, Florida, had read about the plague and it fascinated him. 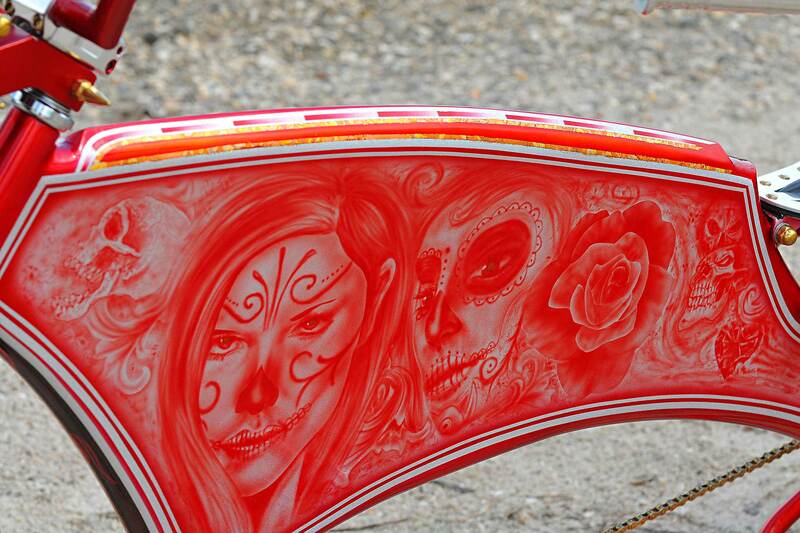 The story was intriguing enough to title his masterpiece “La Muerte Roja,” which translates to red death. As a teenager, Chris began his passion simply because he couldn’t afford a car. “I knew I didn’t have the money for a lowrider car,” Chris tells LR, “so I did the next best thing.” That next best thing was to purchase a bicycle. Of course with Chris’ creativeness that bicycle didn’t stay stock for long. 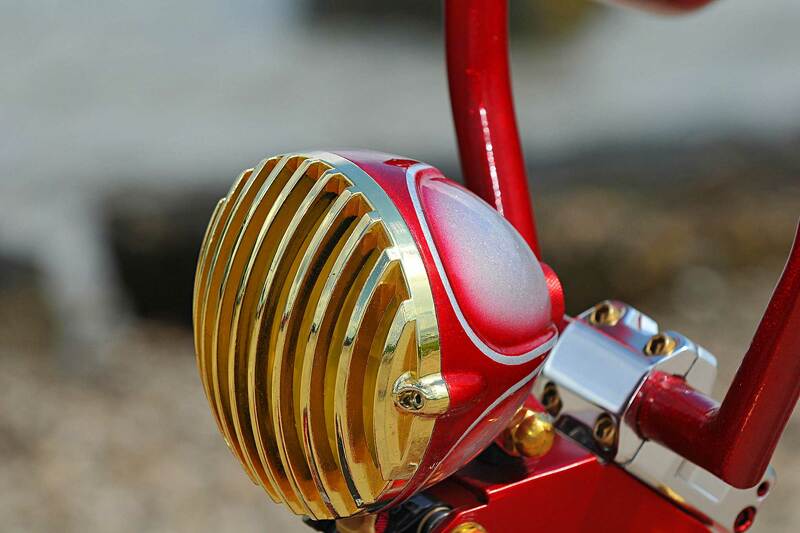 He became so versed in metalwork and custom fabrication in his teens that he knew what direction he wanted to go as an adult. His creations got more intense and intricate and he started getting a following and reputation based on his builds. Once a year in Vegas there is a Fabricators Face Off at an OBC custom bicycle event. 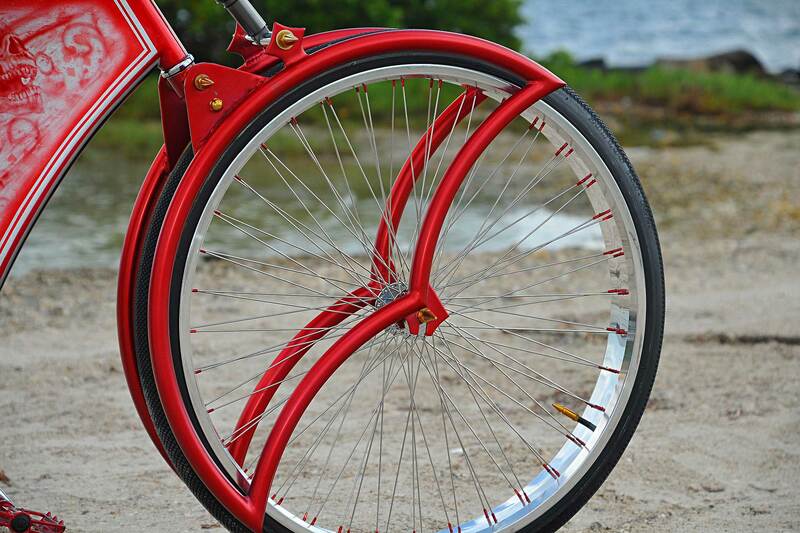 It’s the best of the best showing off their talents on bicycles throughout the country. There is one simple rule to be accepted as a competitor into this contest. 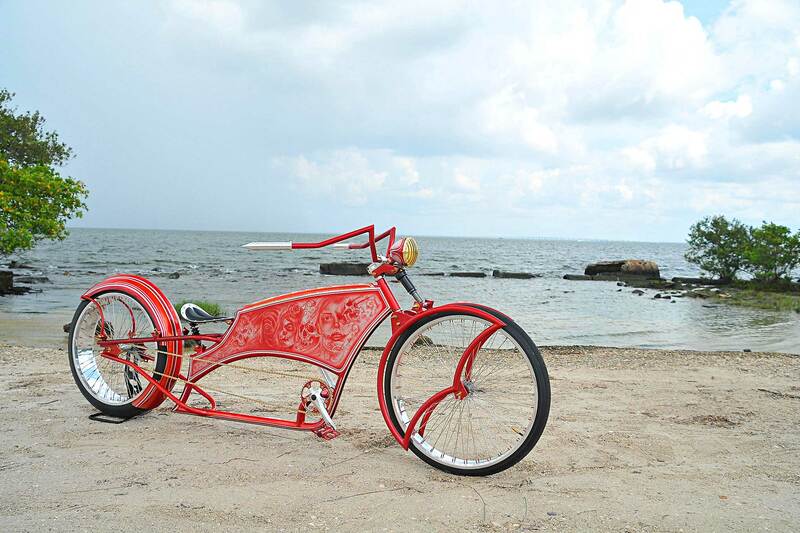 The bicycle accepted had to be built from scratch, meaning it could not be an older or newer frame that is modified. After Chris was accepted out of eight total competitors, he knew it was time to get to work on his project. The first step was to draw out his planned configuration for the bike. The next step was purchasing the tube and metal. A 1 1/2-inch round tube was modified with 7/8-inch back legs. Chris added 18-gauge steel plating on both sides to create the tank. 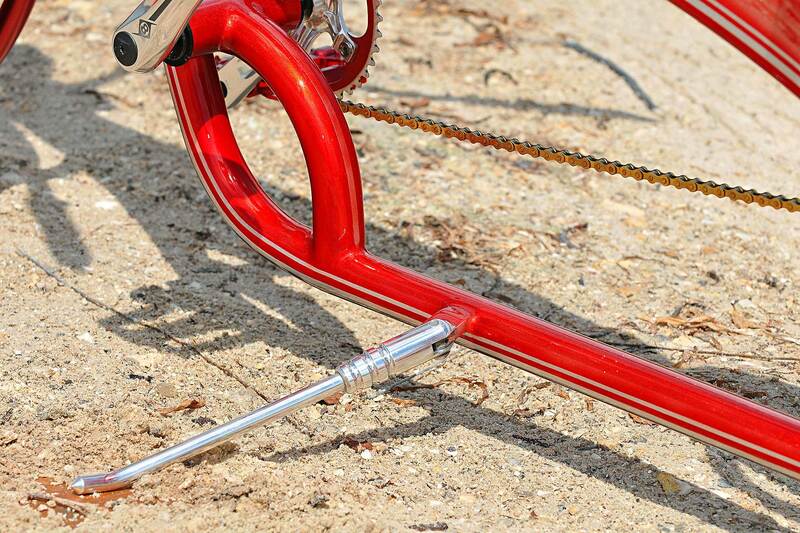 The front bars were constructed from scratch out of the round tube, and the front fork was designed from a 1-inch round tube that Chris manually bent into his own design. 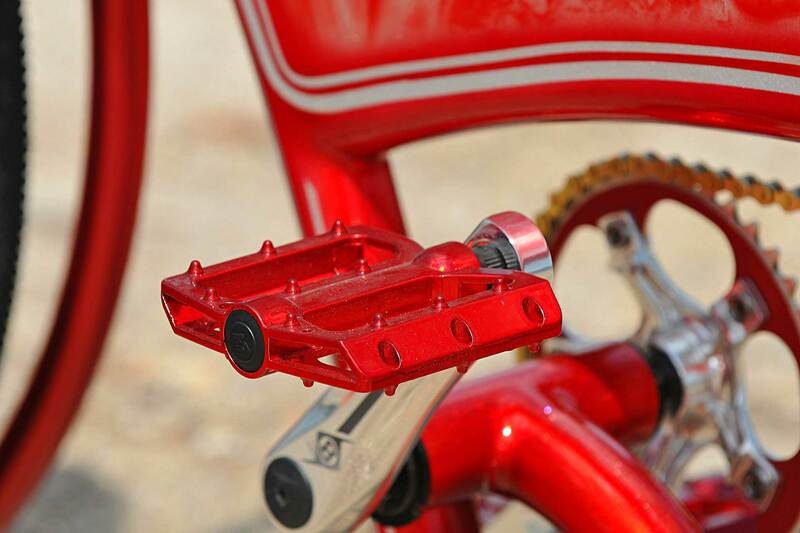 The brackets were handmade, including the shock mounts. Chris was inspired by a motorcycle bagger so he used a 29×3 wheel in the front and the back wheel is a 26×5, which is the widest you can buy. 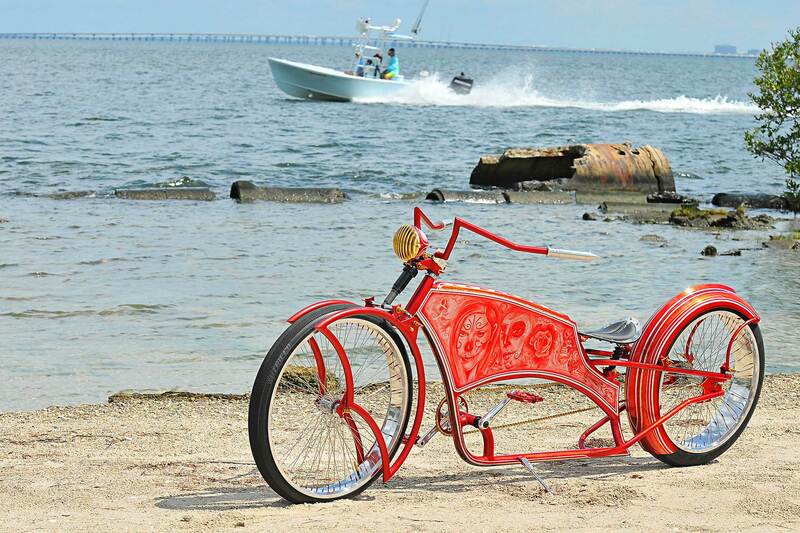 The back fender is from a Harley-Davidson bagger that he sectioned to wrap around the back wheel. 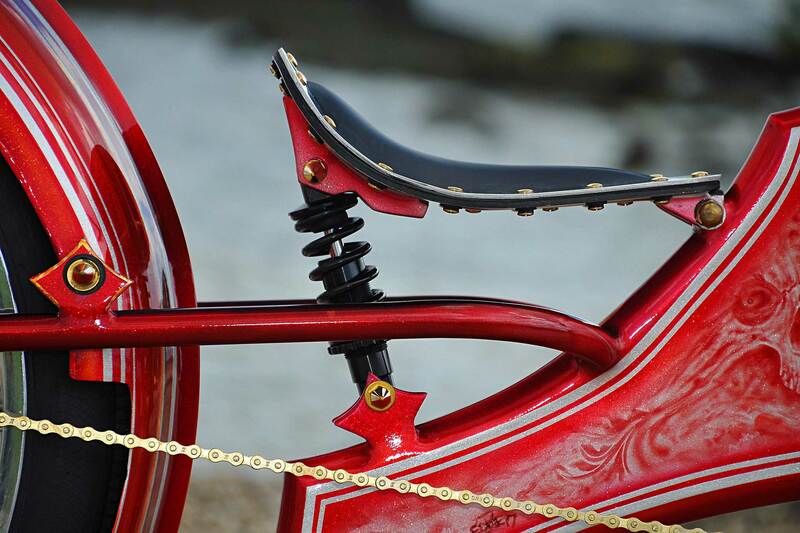 To add more custom to the build, square tubing was turned sideways and bent diamond style and then cut in half and placed on the down tube on the back fender. 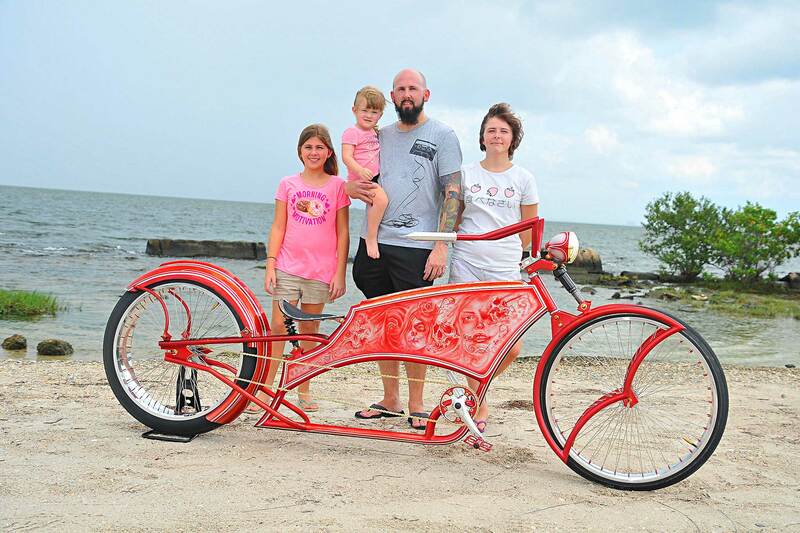 The bodywork was finished on the custom bicycle so Chris sent it over to Eddie Zacharek at EZ Kustoms of Clearwater, Florida, for a complete custom paintjob. 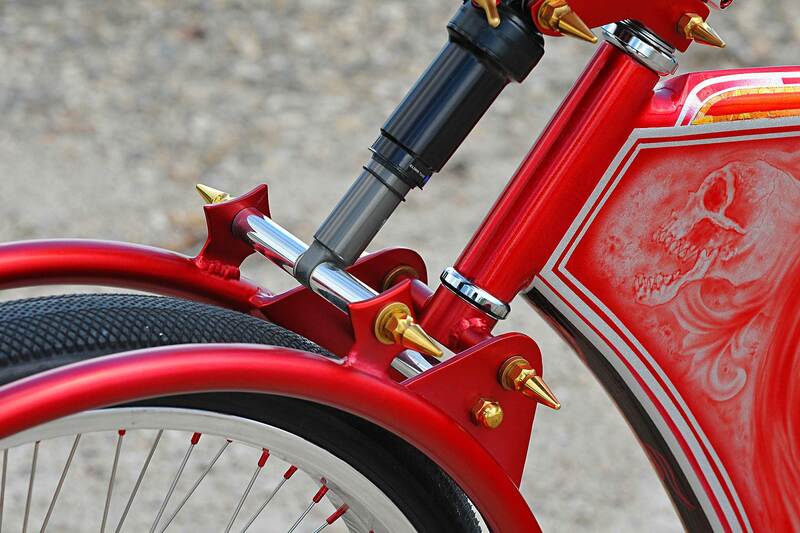 Chris decided that the Red Death theme would go perfect with this competition build. 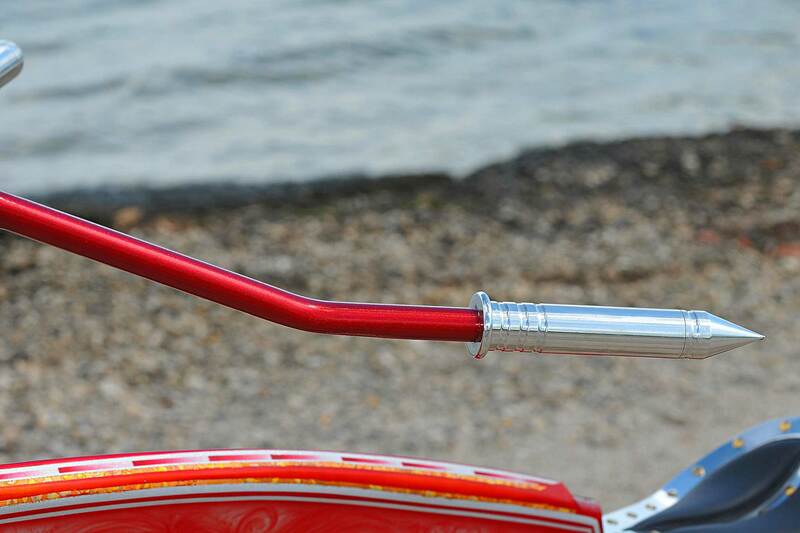 The front fork and the fender were then sent to Pro-Fab Powder Coating to be coated. Chris wishes to thank Eddie for the killer paintjob that turns heads wherever the bike is. He also wishes to thank Robert for the custom wheels, Tim for building the kickstand and grips, and John Lerew for constantly keeping him in line and focused during the build. Chris extends his thanks to his buddies Jason and Joe who drove with him on the 36-hour drive to Vegas for the Fabricators Face Off. Although he didn’t win, he represented Florida with class and creativeness. Finally, he wishes to thank his beautiful wife, Michelle, who stood beside him and never doubted his passion and talent on Red Death. His creativeness led him to start his own custom fabrication shop named CBurke Customs, and he can guarantee he will be in the shop building something even better for next year’s faceoff. Bodywork done in-house at CBurke Customs. 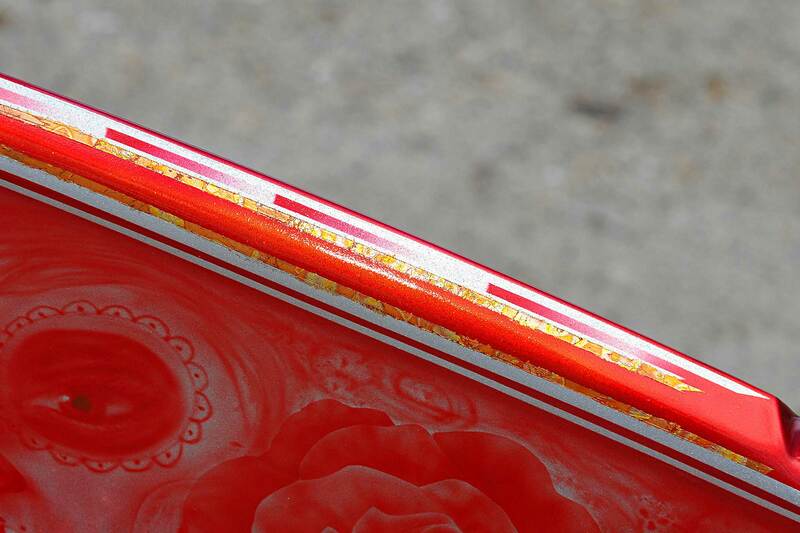 Full flake, seven different layers of different tones of candy paint, variegated gold leafing, pinstriping and red pearls for the hand airbrushed murals, all done with custom paints and Inspire airbrush paints. 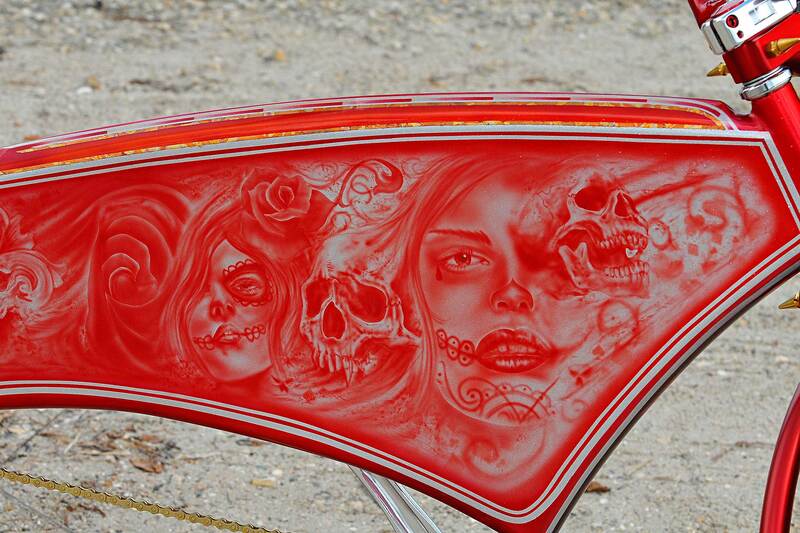 Paint and artwork done by Eddie Zacharek at EZ Kustoms. 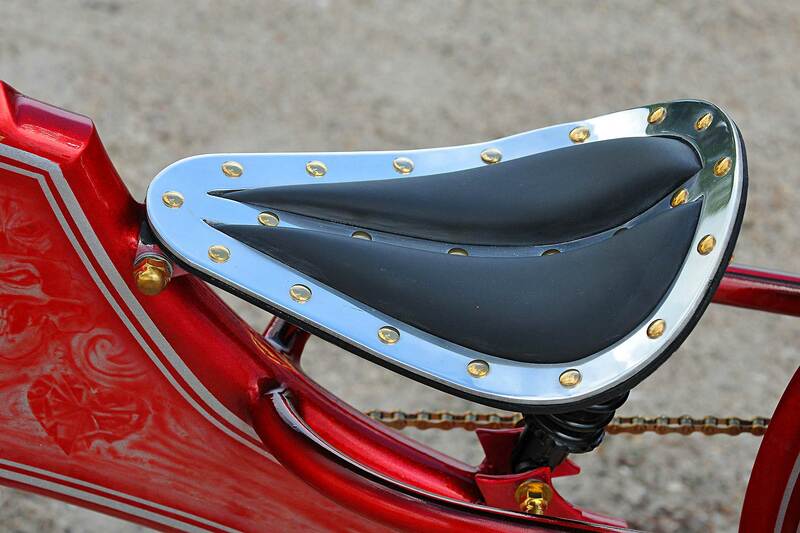 Custom motorcycle bobber seat with custom aluminum shroud, brass Rivets, and custom leatherwork. Seat mounting brackets were molded and attached with an adjustable shock. 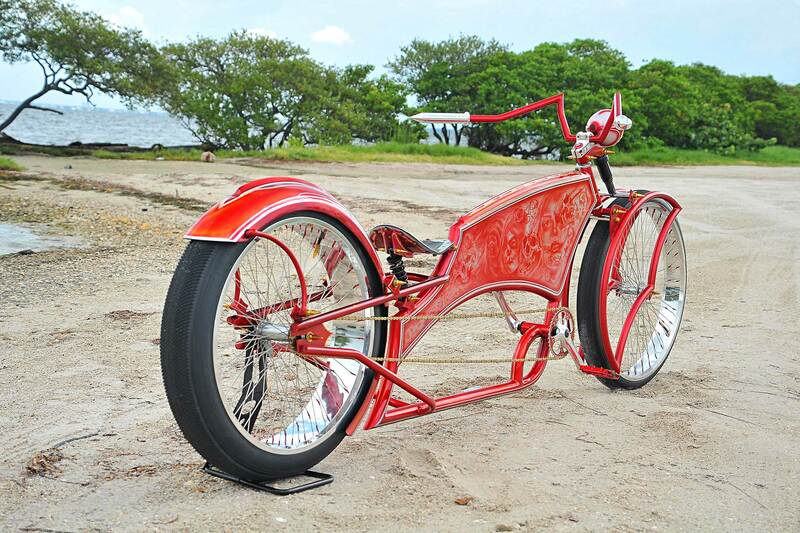 Wheels are 26×5 rear, 29×3 front 72-spoke, built by Robert Gonzales, owner of Most Hated Bicycles & Parts in Arizona. Tires are 26×3.5 rear and 29×1.95 front VEE tires. 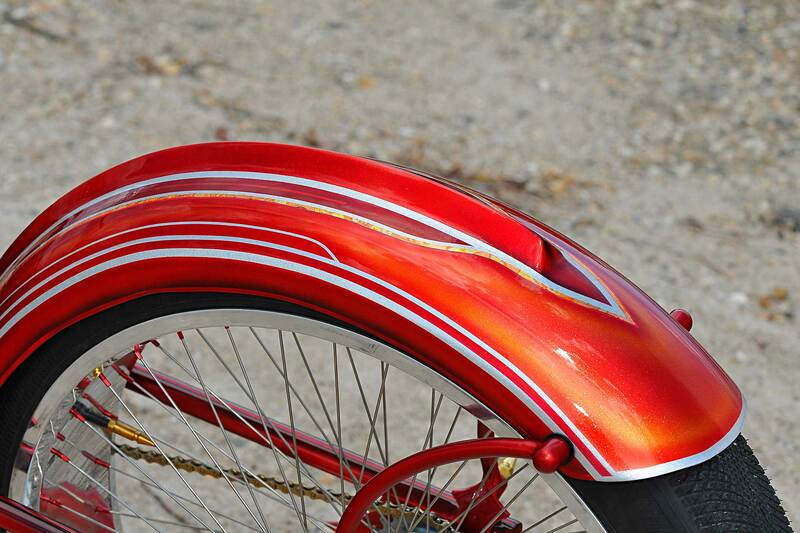 Back wheels are wrapped with a sectioned and modified Harley bagger front fender.